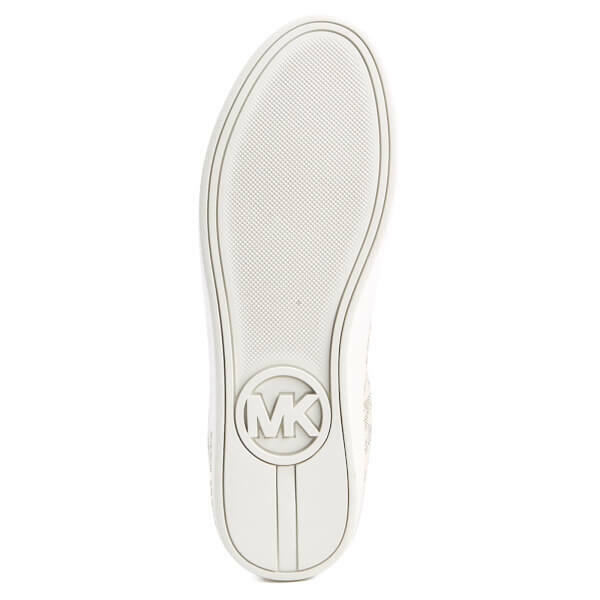 Women’s white ‘Keaton’ trainers with an all over ‘MK’ monogram print from MICHAEL MICHAEL KORS. Crafted from textured PVC, the lace fastened sneakers are detailed with a metal ‘MK’ lace locker and a logo engraved stud on the heel. Set on a contrast white rubber sole, the round toe sneakers are finished with signature branding on the heel, a textured outsole for added grip and a leather insole for comfort. Upper: PVC. Insole: Leather. Sole: Rubber.